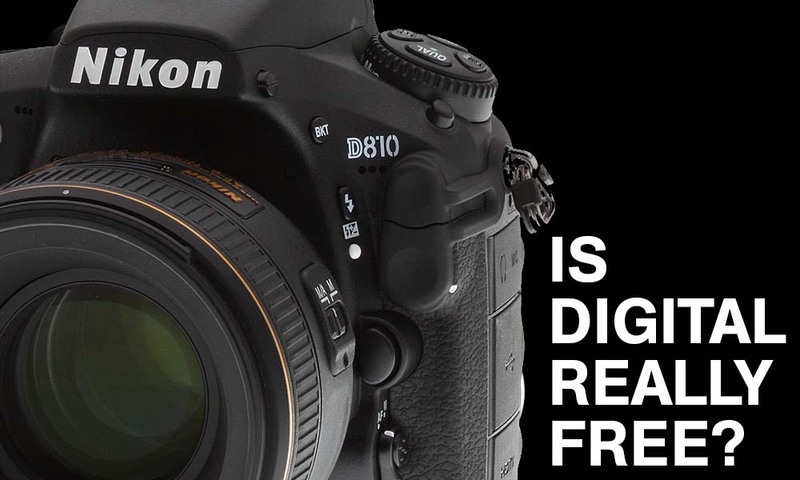 Click away: Digital is FREE, or is it? Recently my trusted Nikon d700 felt it needed a rest. The camera’s shutter is rated for 150,000 clicks. I’ve put this poor camera through the mill taking 149,652 photos over the years. The shutter needs to be replaced at a cost of about $200.00. Not bad, but it maybe time for a new camera. This got me thinking. How many images did I take at the several FREE sporting events I shot or the many, many, many FREE photo shoots I’ve done? If I hadn’t volunteered for these shoots, would my d700 still have life? Yes, but honestly I choose to do those non-paying shoots, I have no regrets. I’m not the type to put plastic covers on my couch so it will last longer. I like to use the things I have. So how much did these free shoots cost me? Let’s stick with a simple black and white answer. If we take the cost of the camera body when new; $2999.00 and divide it by the rated shutter life of 150,000 we come up with $0.02 cents per click. So that 2013 High School Lacrosse season where I took 10,170 photos cost me $203.04 and the 2014 season’s 17,439 photos cost me $348.78. Before we stop volunteering for events or think twice about taking a shot, digital is still relatively inexpensive. If I repair my camera at $200.00, I’ll add that to my initial investment of $2999.00 for a total of $3199. My shutter count returns to zero giving me an additional 150,000 clicks for a total of 300,000. This brings the cost down to $0.01 cent per click. Great for a back up camera. My d700 did us a huge favor by dying. We took a look at our budget and reviewed the gear we use on a regular basis. Studio strobes, speedlights, pocket wizards and even gaff tape. We’ve started to add a fix cost of $125.00 per shoot as an equipment fee. The fee is set aside for camera repairs and miscellaneous cost. The idea came to us after watching a video training course “Budgeting Video Projects” by Richard Harrington on Lynda.com. The same concepts for video applies to photographers. Continue to take those shots and budget in for your next camera. Digital may not be free, but it’s well worth it! Great article, though one thing is that by replacing your shutter you aren’t resetting your camera back to 0. You are merely resetting your shutter back to zero. The rest of the camera is still sitting towards the end of it’s lifespan, I’d be surprised if you can get another 150,000 frames out of it without more repairs. I have to disagree with you Ryan, though the camera body may well be ‘older’ it’s by no means ready to be sent to Kodachrome Heaven, sakes… there are plenty of the original Nikon F out there that STILL work perfectly… like any good tool, a little maintenance now and then is all that’s required. Not really a valid comparison… I don’t know anybody silly enough to shoot 10,170 pictures FOR FREE and ON FILM. But you have a point, the main reason why nobody would do that is indeed the cost of it. When I used slide film (1998- 2004)it was Kodak VS $10Can each 36 roll, if I bought a brick, which I did. It also cost me $10Can to get the slides developed. Then I needed a Nikon Scanner to scan the slide to the computer. Then Photoshop 6.0 cost me $1000 in the days like now, that our dollar paled in value to the US$. I am very happy with the Nikon D4 for wildlife, and the Nikon 810 for landscape. Throw in some Sony mirrorless to carry less weight for landscape. Converted my Nex-6 to color infrared to get a funky look. Digital is far from free. JMHO. There is one factor that I haven’t seen and that is the total of what you learned while doing all those ‘free’ shoots. Learning curves aren’t flat but bumpy. You learn different things in different environment and sometimes those things you learn can be used in multiple places. just think, all those free shoots were actually ‘free instruction’. You can’t place an accurate price on the things you learn that saves you future errors. Great insight. The only time I felt it was a waste of time, both from the learning sense and financial benefit, was when I wasn’t having fun or learning something new. At that point I usually took on an intern and used the time to develop my teaching skills. Interns… zomg, that is brilliant! Haha, I should start doing that! Excellent article. I was shooting at a church event and of course I didn’t charge them for taking pictures. But this one lady came up to me after the event and wanted to know if we were related. Anyway, after finding out our family tree, she has an event that she does every year and she hasn’t had much luck finding good photographers. She wanted to know if I would shoot her event for free and if I knew anyone else that could help. I must have been caught up in the family tree/church event/kumbaya feeling that I said I would shoot the event free. She said she would pay for the film. (She knew that I don’t shoot film.) Well, later on, after the evangelical feeling left me, I thought, hell no. I don’t any more free “experience events” to shoot. So I am gonna email her back and tell her my event price. Now I have to figure out how much each digital picture would cost me. Can you possibly do a quick edit on this, so the math actually works? Please change .02 cents per click to either “$0.02 per click” or “2 cents per click”, and similar for the .01 cents per click examples. If you say .02 cents per click, that means it’s 50 clicks for one penny, whereas the corrected 2 cents per click means it’s 50 clicks for a dollar, and that’s a lot different. So .02 cents per click is right. Well that begs a question – for a newbie buying their first camera, is it worth it to by a used one then? If replacing the shutter costs, say half of what the used purchase price is, would buying new better? Missy good question. It’s hard buying used gear unless you know the person you’re buying it from or the company. You can ask for a shutter count and see how many photos were taken. I did buy the D700 used from a close friend who hardly used the camera. It served me well for years. My D810 ia new. Since we bought it a week ago, we found there is already a recall. Buying new means you know for sure if maintenance and recalls were handled. Last advice… it’s better to invest in high quality lens than the camera when starting out. Camera are easy to replace in a few years, great quality lens can last forever. In the digital world it is easy to click away, throwing shutter clicks away like they are nothing. Protect your not only your gear but your future as well. The discussion of shutter life cycles brings up my question about how you go about checking how many shutter cycles any particular used camera has. I want to make the jump from film to digital on a budget to learn the ins and outs before I spend thousands for equipment. I’m looking at a Canon Rebel XT. How do I find out what the shutter cycle life is? Perhaps it’s okay for professionals like you because you can afford another camera/replace the shutter. But for us amateurs, it somehow becomes a big deal. I often think of shooting less because I have an entry level camera with less shutter actuation. And when it reaches the number, the shutter replacement isn’t going to be worth the money. I’ll have to buy a new camera. Thoughts like that often make me want to spend less time shooting for practicing. What do you mainly shoot. I mainly shoot portraits. But due to myself being an introvert I know very small number of people. So most of the time I don’t have a subject to shoot. I like taking landscape shots but I have a hard time finding a subject/composition. I mean, it’s out of my comfort zone, if you will. I like shooting portraits. I’m not best at it, and it has its challenges (how the model wants to look doesn’t always match how I want them to look 😛 ), still I enjoy doing portraits. Other than that I work as a part time journalist so I shoot technology events and gadgets from time to time. Exactly! Now before you stop photographing family events and they show up on my doorstep asking for my head, 150,000 photos is a lot. Remember I shoot 9 frames per second for sports using only 1 image. Plus I’m really hard on my gear, shooting in the rain and mud. Your camera should last a long time. This is helpful if you buy a used camera. Thanks for your response! I take very good care of my gadgets (laptop. phone, camera, etc). And I love my camera so much that I cannot think being without a camera (though I do not shoot that much in comparison to how much I love). And that’s one reason why I’m afraid of shooting unplanned (like street, nature, random portraits, etc). If my camera stops working because of me taking too many pictures, I don’t know if I can buy another one (depending on the financial situation of that time).